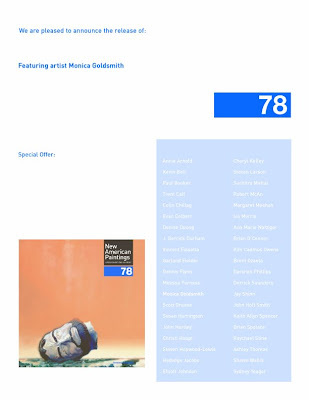 Two artist’s I’ve written about previously are featured in issue #78 of New American Paintings. Monica Goldsmith paints hard-edged, geometric abstractions dealing with the environment and land use. Goldsmith is an MFA candidate at the Art Institute of Boston. She is represented by Gallerie Urbane in Marfa, TX. Kevin Bell explores nature and human intervention in fragmented realism. Bell used to teach at Fort Lewis College in Durango, CO. Now he is teaching at the University of Montana in Missoula.